Long before the beach was a theater of bodies stuffed into tiny suits, exposing as much skin as possible to the sun, beach-going was often a strictly medical undertaking. For centuries we looked to the sand and surf as a fully-stocked pharmacy. But first, we had to get over our fear of the sea. Any 17th-century European pirate could tell you terrifying tales of sea monsters dwelling in the dark waters. A pirate was about as likely to swim in the sea as a pilot is to jump out of his plane. In fact, no one thought of the sea as a particularly friendly place. And, as the gateway to the sea, the beach wasn’t so appealing either. In modern Europe, only peasants sought refuge from the heat in the cool seawater. And so the beach remained mostly empty until the English looked around and began to consider the medicinal potential of their chilly national shoreline. Eighteenth century British high society suffered from a mess of maladies. Fevers, digestive complaints, melancholia, nervous tics, tremors, and even stupidity were the epidemics of the day. The pressures of urban life, pollution, and the general deterioration of society were obviously to blame. Enlightenment physicians began to consider new remedies for old ailments spurred by the new emphasis on science and experimentation. Their new wonder drug was… water. Cold sea water, specifically. Beginning in the late 16th century, English physicians endorsed the healing effects of cold water for everything from heat stroke to melancholy. It was believed that a brisk shock of cold water stimulated the entire body, promoting the circulation of humors and even contracting tumors. As Lena Lenček and Gideon Bosker lay out in their book, The Beach: The History of Paradise on Earth, sea bathing as a form of therapy brought together the fear of the sea with the hope of its healing powers. By the mid-18th century a standard therapy was developed, which resembled waterboarding far more than a spa treatment. 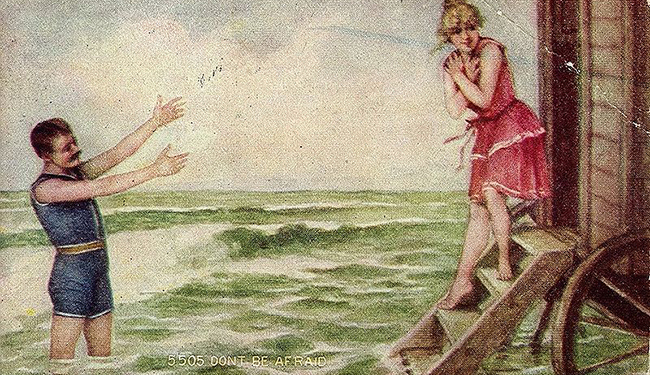 It involved dunking society ladies in the freezing sea repeatedly until the twin effects of cold and suffocation caused terror and panic (read: revitalization). The frightened patient would then be hoisted from the water in her soaking flannel smock, revived with vigorous back rubs and feet warmers, and deposited on dry land for a cup of tea. The adrenaline from the shock of cold was thought to have soothing effects on the body, calming anxiety and restoring the body-soul balance. The patient would repeat her regimen every morning for the next several weeks of her therapeutic seaside sojourn. The men got to take their therapy naked. It wasn’t enough to nearly drown in the sea to relieve your stresses and ailments; you had to drink it too. 18th-century physicians and scientists looked back to the classical texts of Hippocrates and Celsus and revived the medical practice of drinking seawater (classically sweetened with honey, or, as the British for some reason preferred it, diluted with milk). In 1750 Dr. Richard Russell published a treatise, A Dissertation on the Use of Seawater in the Diseases of the Glands, Particularly, the Scurvy, Jaundice, King’s Evil, Leprosy and the Glandular Consumption, in which he advocated using seawater for bathing and drinking. In one case, Russell describes a man suffering from leprosy; a “most troublesome case.” The patient’s head and entire body was “sprinkled over with leprous spots.” But after being prescribed to “drink a pint of sea water every morning during nine months, without any intervals” the patient recovered. The regimens also usually involved bathing in seawater to strengthen and invigorate the body. As seawater drinking became more popular, these kinds of case studies proliferated. The miracle of the sea seemed to provide infinite therapies. Naturally, someone was going to capitalize on it. Enter, the resort industrial complex. The seaside resort was where the serious healing took place. The sea air along with the ocean views and warm weather were considered critical to a patient’s recovery, especially when treating tuberculosis. But dunking yourself in the water until you nearly drown only takes a few minutes. With treatment plans lasting weeks and even months, the captive patients required additional treatments and plenty of entertainment to pass the time. First appearing up and down the British coast and then spreading to the Continent, seaside resorts offered a kind of holistic self-improvement retreat where the mind, body and soul were treated simultaneously and with equal attention. Horseback riding purged bad air, sailing calmed the nerves, dancing and dinners promoted social connections, and geologically themed beach excursions stimulated the intellect. But bodily healing was the main event, and patients believed that their own scientific observations played a critical role. Patients kept personal logs of their progress, and detailed their physiological responses to sea therapies from their bowel movements to their circulation. The sea resort remained popular for treating tuberculosis until the epidemic finally abated in the 1860s, despite the fact that there was no real proof of its success. As seaside resorts popped up all over Europe and the U.S., they became less about therapy and more about entertainment. By 1911 there were more than 100 seaside resorts in England and Wales alone, according to The English Seaside Resort: A Social History. With better roads and train transport, the masses rolled in and the elite rolled out—seeking their fresh air fix in the country away from the riff raff. But having exploited its water and air, there was one more element of the beach that the medical establishment had not yet seized upon: the sun. Until the 1920s, people went to the beach in spite of the sun. Ladies would bundle up and shade themselves under umbrellas and canopies to shield their alabaster skin from the toasting effects of the sun’s rays. The aristocracy thought dark skin was for peasants and natives who had neither the elegance nor the privilege to live a life indoors, according to Lenček and Bosker. The sundrenched parts of the world were home to the great fallen civilizations of history like the Phoenicians, Greeks and Romans. Clearly, the sun loosened morals and melted minds. Then the Germans got naked and changed everything. By the end of World War I, the Western World saw sun-loving civilizations that were once cautionary tales of vice, such as the Greeks, Romans, and Mayans, as healthy and pure. In Germany, the free body-culture movement, Freikörperkultur, promoted nudism and a new respect for the body unfettered by society’s constraints. Being healthy meant displaying a body that emanated the very glow of nature—the sun. Everyone from the avant-garde artists of Weimar to Hitler embraced the ideal of the robust, sun-kissed body. Tanned skin became the height of chic, embodying the opposite class distinction that it had during the previous century. And, it joined seawater and sea air as the panacea du jour. In 1944 The Journal of the American Medical Association promoted the sun, air and sea trifecta as a cure for everything from tuberculosis (still) to a cold. Companies capitalized on the sun's appeal by promoting contraptions like a personal hothouse that captured “health rays” right out of your backyard. Resorts like those at Palm Beach were promoted as fountains of youth and beauty. Many beaches had tanning-oil dispensers and “Tan-O-Meter’ charts illustrating the amount of exposure needed to acquire the perfect healthy tan. Swimsuits shrunk to allow for maximum surface exposure. Though sunbathers were cognizant of burning, no one would worry seriously about sun damage for decades. These days we have 100 SPF sunblock, but our desire to find medical answers at the beach continues. British researchers looked into the benefits of seaside living, which positively associated with good health. Thankfully, though, we’ve come a long way from drinking milky seawater.